Pretty flowers, start of summertime! 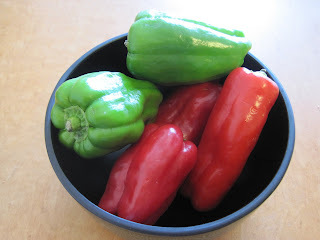 Tiny Asian peppers. So small, so delicious. 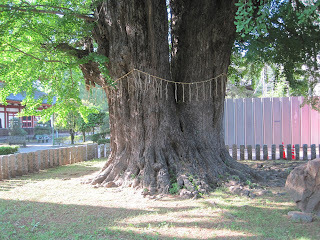 Giant Ginko Tree. 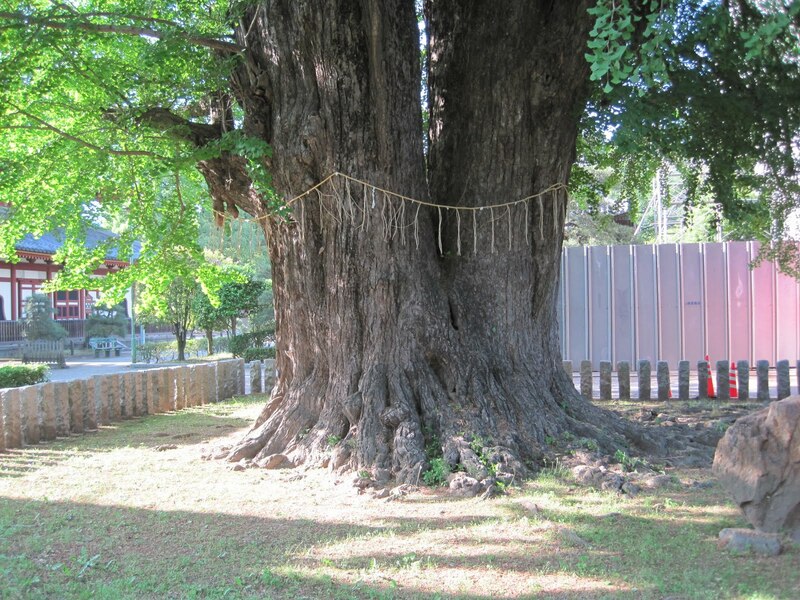 There's a lot of tree to hug. 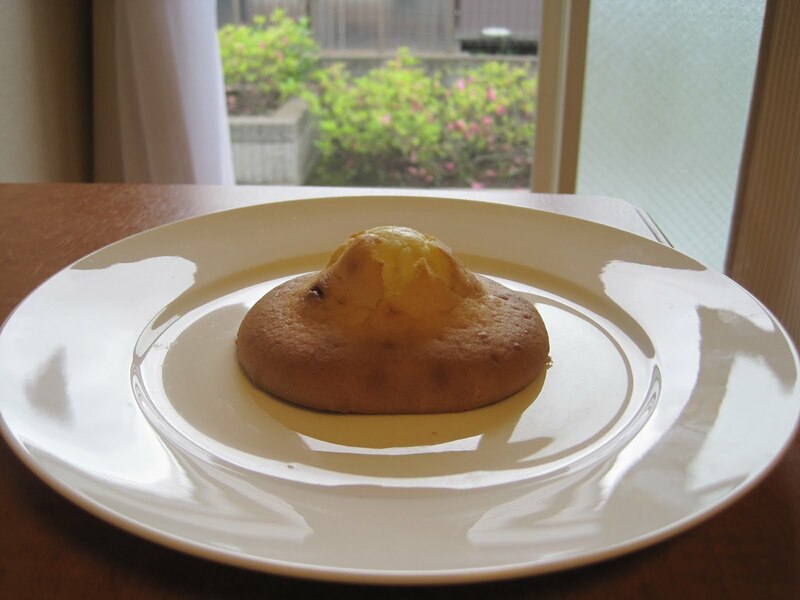 Muffin tops. I just found them in the grocery store here in Japan, amazing! They come in packs of 2...yum! Needle felting!!! I'm so obsessed with it now, it's so much fun! Visit here to see other people's faves! Seriously, I can't believe I haven't tried needle felting before! I bought some loose wool fibers today at the craft store and decided to start small with making some simple coasters. I've done felting before with knitting projects, but never with just loose wool. 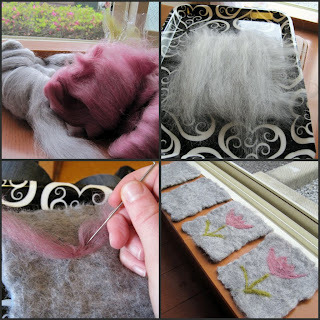 I read some felting 101 here that was very helpful. The edges on the coasters aren't completely straight. I could have cut them for a smoother edge but I personally like the look of the natural felting. 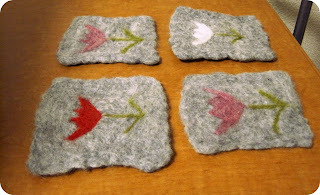 Once I felted the coasters into square-ish shapes I began the needle felting. It's way easier than I was expecting, just keep stabbing away with a felting needle! Just make sure the object you're felting onto is resting on a surface that you can stab on. I put my coaster on a thick (new) kitchen sponge and it worked perfectly. I noticed they sell special "stabbing boards" at the craft store but they just looked like giant sponges. I opted not to spend the $10 on one and used my cheap-o sponge instead. It was great. Felting is great. Wool is great. And, of course, weekends are great. Here he is! Not quite finished, as you can see. He's been stuffed, sewn and ready for his face to be embroidered. I'm practicing before I embroider right on his face. It'd be a pity to mess it up now. 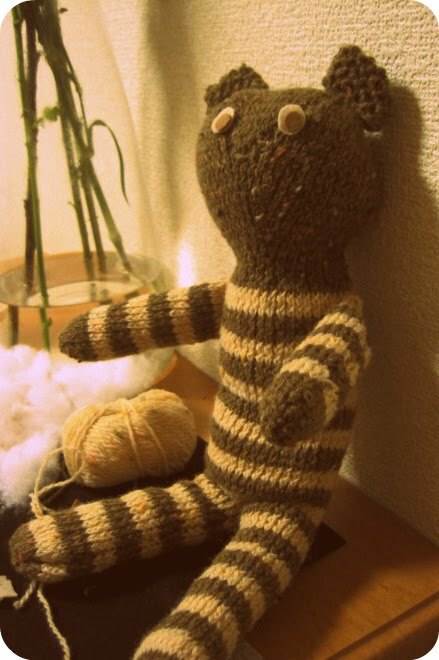 I'm using the pattern for the flat ted bear from Zoe Mellor's Knitted Toys. She doesn't give any instructions for how to embroider the face, and I'm no pro at that stuff...so yes, I'm worried I'm going to mess it up. No one wants a creepy-faced teddy bear. Wish me luck. After a little embroidery practicing, I'm going to attempt needle felting this weekend. Everytime I go to the fabric store here, there are these cute-but-kinda-weird prepackaged felting kits to make little animals, people, food, ect. I can't quite make up my mind about them so I'm going to just make one. 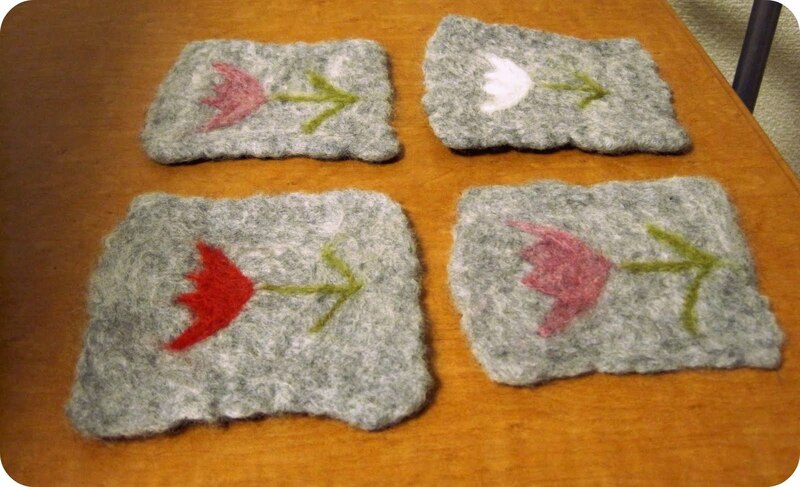 And although I might not be a fan of the felted toy-things, I think I will definitely like needle felting on fabric. 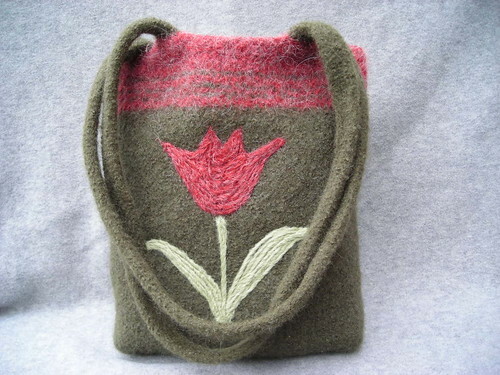 I have this really neat felted bag that my sister got me in Sweden, and I would love to be able to recreate a version of it. I also really think this needle felted bag is pretty adorable. Ah...the weekend. It's been a rainy, gloomy day here in Oyama. A perfect day for indoor crafting. Two big birthdays are coming up - my mom's and my sister's. 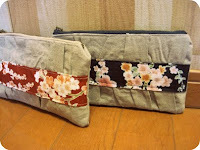 I want to mail them both a little something and thought this clutch would be perfect. 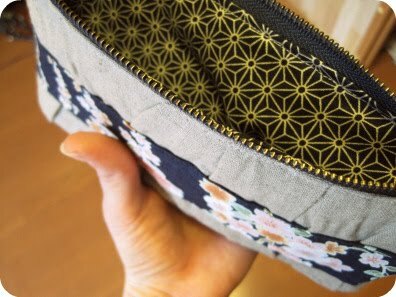 It's small enough to just use as a change purse, but big enough to throw in the essentials (credit card, cash, cell and a key or two) and head out the door. I found some really cute Japanese fabric when I went to the fabric store this morning (just a 10 minute walk from my apartment!) and bought some in blue and red. The tutorial was so easy to follow and I made both in just a couple hours (with a couple coffee breaks throughout of course). I'm really happy with how they turned out and they will fit perfectly into a padded mailer for a lovely birthday surprise. If I had bought a couple more zippers I would be making a few more just for the heck of it. Instead, I'll probably end up watching a DVD and eating chocolate. I made this messenger bag a couple weeks ago after a long day in Tokyo with my purse falling off my shoulder. When I'm going to be walking for long periods of time, I prefer to carry a bag that slings over my body, rather than having to hold one up on my shoulder. 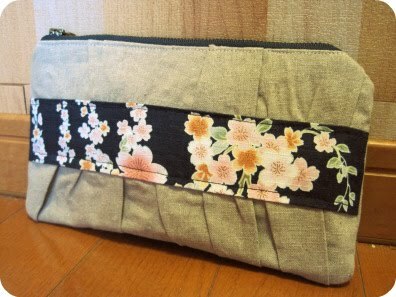 Not wanting to spend a wad of yen on a new bag, I made this one for under 800 yen ($8). It's been a great basic, functional messenger bag. The tutorial over at MmmCrafts is so easy and quick, a great afternoon project. I opted for no applique on the front flap but added a few removable fabric flowers instead. This way I can switch it up when I get sick of the flowers. I'm contemplating sewing some big antique buttons on, or non-antique buttons...whatever I find. In other crafting news, I started knitting a teddy bear from Zoe Mellor's Knitted Toys about a month ago, and I'm sooo close to finishing!! I just need to knit the ears, sew it up and stuff it! I love knitted projects. They take me the longest to make, but I get so excited when they're finished, and I can't wait for this bear to be done! The kids' fabrics are especially precious. I have one adorable neice (who just turned 5!) and one more neice or nephew on the way. I'm planning on using much of the kids' fabric I've acquired here making things for them. I'm looking forward to trying these cute reversible baby booties and this super cute shirt-dress. I might even try making one of those shirt-dresses in my size...we'll see. 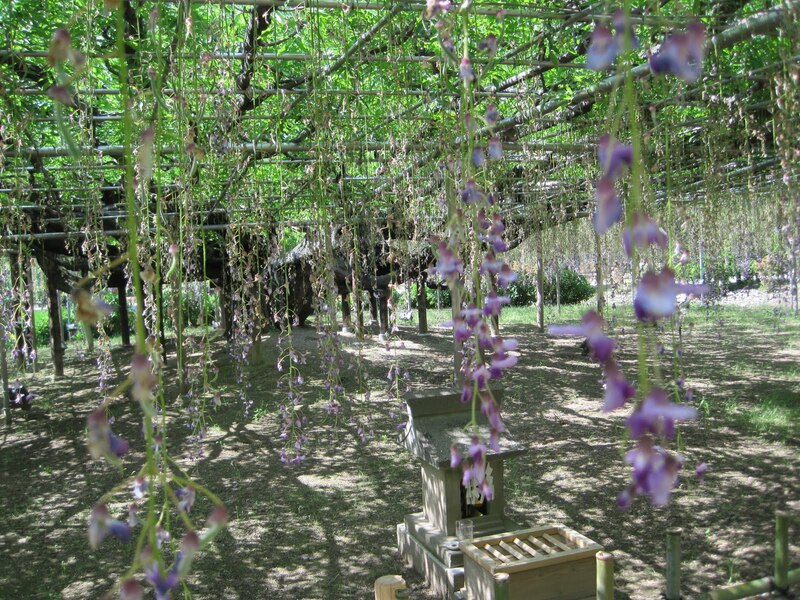 Today, I'm off to see the wisteria blossoms in Ashikaga. 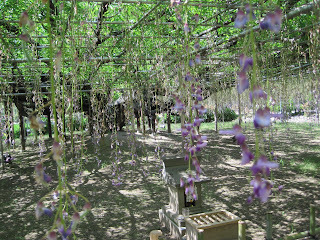 I hope they're still in full bloom! I've wanted to hop on the craft blogging bandwagon for quite some time now, so I decided to stop procrastinating and just do it. So here it is. I'm no professional crafter, or blogger for that matter. But I want to keep track of and share any and all crafts attempted, both successes and failures (and believe me, there have been many failed crafts). So here I go. Let the crafting begin!